The state of the subway subway map looks a lot less depressing today, with the MTA opening lines over the weekend and this morning, but commuters still face long lines and crowds. The state of the subway subway map looks a lot less depressing today, with the MTA opening lines over the weekend and this morning, but commuters still face long lines and crowds. While that map above makes it look like business as usual for the majority of riders, with only B, G and Z totally out of commission, a number of lines still have limited service. Plus with 90 percent of schools back in session the continuing fuel shortage and closed Hugh L. Carey and Queens Midtown tunnels, the system has more people in it than usual. So commuters largely slogged into work this morning, just as the MTA warned they would. We are running more service this morning but not at regular rush hour levels. Limited service on all lines. Plus, as a precaution, the actual trains themselves are running slower, note The Wall Street Journal's Ted Mann and Laura Nahmias. 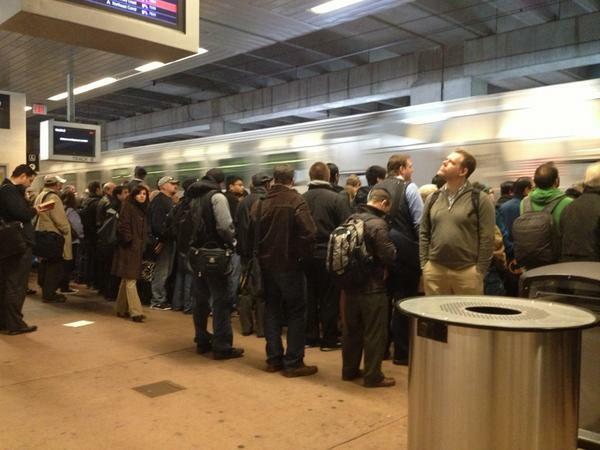 All of this has led to crowded trains, which sound especially bad for Long Island and New Jersey commuters. A little Instagram reporting shows lines on the NYC subway platforms, as well as to get into the stations. And people on Twitter confirm the masses of humans getting from one part of the city to the next. The Wall Street Journal's Elizabeth Holmes called it a "mess," for example. With the L still down from Brooklyn to Manhattan, some have resorted to the East River ferry, which has also drawn long lines. Coming from even further, many LIRR commuters missed trains because of the crowds, reports the Associated Press. And with Path still suspended, lines for the Jersey City ferry "quickly stretched to several hundred people by daybreak," continues the AP. New Jersey Transit has limited service, but as you can see in the photo below from Reuters's Matthew Keys, that's packed, too. Things are improving, however. Today, Mayor Michael Bloomberg made it to City Hall riding the 5 train from 59th Street, as promised. And despite the uncomfortable commute, people sound happy to be reunited with their usual morning routines. Here's The Atlantic Wire's own Gabriel Snyder jolly after his trip from Brooklyn to our SoHo office. Subway ride this morning, crowds and all, felt like a minor miracle. Thanks, MTA. And, considering the extent of the damage, the service available is pretty impressive. Imagine what today's commute would look like if the subway were still out of commission.